Leader in classroom innovation HamiltonBuhl and its partner Early-Adopter, are excited to present “HACK HISTORY” - a day long event where teachers will compete to create their best lesson plans using ChronoQuest™ - the new augmented reality timeline that makes learning about history FUN. ChronoQuest™ allows any teacher to create any customized lesson plan surrounding any type of historical event that happened between 1500 - present day. As students explore the timeline with their smartphone or tablet, augmented elements that the teachers have chosen POP out at them! 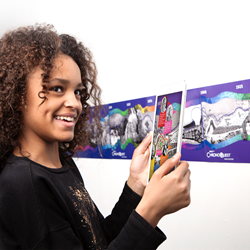 Students can interact with these elements via weblinks, audio, or video of the teacher’s choosing, all while feeling a sense of historical scale provided by the century by century posters that hang on the wall. The event is being held on Friday, August 18th starting at 10:00 am and ending at 4:00 pm at &CO coworking space in Jersey City, NJ. The day will start with the teachers being introduced and trained on how to use ChronoQuest™ -- no knowledge of coding required! Participants will need to bring along their smartphone or tablet, and a laptop to easily program content onto the timeline. At the end of the day teachers, either in groups or individually, will present their lesson plans to the judges. The winner will receive a FREE Printed ChronoQuest™ system for their classroom -- a $120 value that will WOW their students this next school year and years to come. To join this day of networking, augmented reality, history, and lesson planning for FREE go to hackhistory.eventbrite.com. About HamiltonBuhl: HamiltonBuhl (http://www.HamiltonBuhl.com) is a leader in the design and manufacture of electronics and presentation equipment for education and industry. From its humble beginnings in 1933 as Hamilton Electronics, to the 2011 merger with Buhl Industries, HamiltonBuhl has grown as an innovator delivering quality, durability and reliability. Always at the forefront, keeping a finger on the pulse of latest innovations, HamiltonBuhl products help facilitate and accelerate the learning process for students of all ages.